How Much Should You Invest On Marketing? Someone recently asked me how much of a business' sales should be put towards marketing. My answer might surprise you. 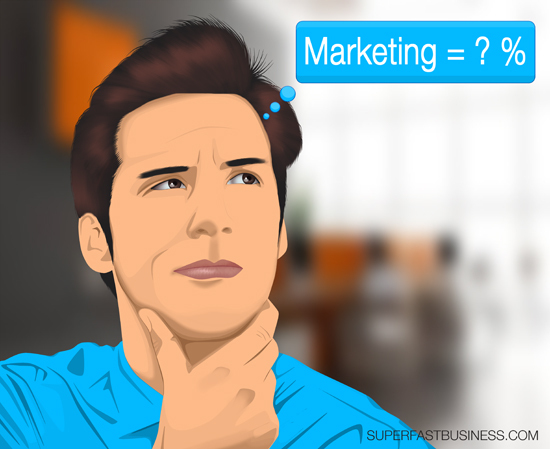 00:01 – What percentage of sales should go to marketing? Should you have a marketing budget? [Click To Tweet]. Consider lifetime customer value. [Click To Tweet]. What percentage of your sales should be spent on marketing? That’s one of the questions I had on SuperFastBusiness.com. So here’s my answer. It shouldn’t really be a percentage. Now, I know in my old business, say the Mercedes-Benz dealership, they had a KPI or a key performance indicator that they would budget towards marketing. And that was tracking at around 1 percent of total sales revenue. Now, in your business, you might have an amount that you’re spending on marketing and hopefully, you’re tracking it. Now it can’t always be tracked, and if you have a look at the philosophy of companies like Apple, they’re very strong on branding and not everything is trackable to the dollar. If you go the direct response route, then everything is trackable. In a business like mine, some things aren’t completely trackable. Perhaps if I go overseas, I attend an event, that mightn’t be instantly trackable. But I will feel for the general rise in business when I go and meet people and start putting through orders. And every time I attend a podcast, a new person finds out about me. And every time I post on Facebook, a new person finds out about me. So as long as you’re allocating a percentage of your energy towards marketing, and continuing to grow your business, that’s more important than a strict percentage. Do you really need a marketing budget? What you really want to do is take the total amount of sales that you have for the lifetime value of your customer, and work out what a customer is worth to you. This is called lifetime customer value. Now, there are a few things to consider. There is how many times they repurchase, how long they stay for. You may not ultimately know. You might need to sort of draw a line in the sand and say, well, in a 12-month period, the average customer is worth X to me, this is how much I could invest to get those customers. And you also need to factor whether you have a lifetime customer model, or a transactional model where you have just one-time customers. In any case, just make sure that you are thinking about your marketing, that when you invest in marketing that you try, wherever possible, to track the return on that investment so that you can make better calculations. Most business owners aren’t tracking anything, so any kind of tracking is a good start, perhaps a simple spreadsheet. What you spend, where you spent it, and how much business came from that. Now if you have an online business, then you can use Google Analytics for tracking goals. You can also do things in your shopping cart like track the value of a customer and the value of a product line, how many people purchased a different product after the first product. So these things are all important. In any case, it’s not a strict percentage, but it’s something you need to pay attention to. I hope this is helpful. I’m James Schramko, catch you again soon.